A solidly-built ruckman/centre half forward who possessed an excellent pair of hands and possibly the world’s least conventional kicking action, James Manson played a key role in one of the most famous AFL premierships of all time. Born in 1966, James Manson’s footballing bloodlines could hardly have been better as the son of 210-game Glenorchy champion Jim Manson. James began his own senior career with North Hobart in 1984, and although he played only four senior games for the Demons such was the youngster’s impact that he was signed at year’s end by VFL side Collingwood, joining the Magpies ahead of the 1985 season. His first season at Victoria Park was outstanding, playing 17 games and booting five goals against Hawthorn in just his seventh appearance, however his next two seasons were far less prolific, spending much of 1986-87 in the reserves. No to be deterred, Manson bounced back spectacularly in 1988, establishing himself as the number one ruckman and winning a career-high 198 hit-outs as well as booting seven goals in his 17 games. By now he had become a cult figure with the Collingwood faithful, partly thanks to his awkward kicking style of dropping the ball from almost chest height and kicking with a heavily bent knee, and partly for an almost ‘class clown’ on-field persona. The latter was never better demonstrated than one day against Geelong at Waverly Park – after taking a mark deep in the forward pocket, Manson – very convincingly, to the umpire at least – faked a back injury to allow the nearby Ron McKeown to take the shot at goal. After McKeown had slotted the major, Manson miraculously recovered and jogged back to the middle of the ground to contest the centre bounce with what can only be described as a very satisfied grin on his face; his Geelong opponents – Andrew Bews in particular – were none too impressed! After a solid 1989 Manson’s best season by a country mile came in 1990. He played all 26 games, booted 33 goals (including four against Carlton in Round 2) and provided great ruck support for young star Damian Monkhorst. Never was this support more crucial than on Grand Final day – up against experienced Essendon pair Simon Madden and Peter Somerville – Manson’s efforts in the ruck as Monkhorst’s relief helped the young big man conserve his energy and eventually gain the upper hand in the middle of the ground, contributing greatly to Collingwood’s premiership triumph after an often heartbreaking 32-year wait. 1990 would also be a great year for Manson in representative football when, as a member of the Tasmanian side that famously stunned Victoria at North Hobart Oval, he was awarded the Lefroy Medal as his side’s best player. 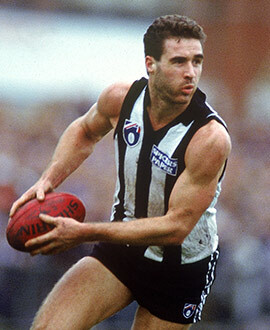 Unfortunately, Monkhorst’s continually accelerating development and eventual stardom meant that opportunities for Manson were greatly reduced, and after just 12 games in 1992 Manson was traded by the Magpies to struggling Fitzroy. The Lions had desperately needed a big body in the ruck since the departure of champion Matt Rendell, and the 26-year old Tasmanian fitted the bill perfectly. Manson spent three serviceable seasons with the Lions, occasionally producing some superb games before a severe back injury forced him into retirement at the end of the 1995 season at the age of just 28; he had played 47 games with the Lions and 167 VFL/AFL games overall. Manson remained in Victoria after retirement, spending one year back at Collingwood in 1996 as ruck coach under Tony Shaw before stepping away from the game.